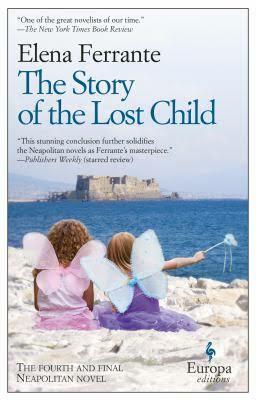 With the Story of the Lost Child, Elena Ferrante brings the final volume of the Neapolitan novels to a powerful, deeply moving conclusion. Reading the book was an exhilarating experience—finishing the book was a depressing one. There are no more Ferrante books to read. I’ve read everything Ferrante has written and it’s not clear whether anything else will be published. So there’s nothing left but to re-read, and Ferrante’s books are meant to be re-read. I’m now re-reading the first book and picking up nuances I missed the first time around. The first time I was so absorbed in the story and reading quickly to find out how it would all turn out that I missed a lot of the subtleties. I don't feel a great difference between my first three books or this last one. Certainly the set up counts: in the past I've written about women in an intolerable moment of crisis, here [in the Neapolitan Novels] the joys and wounds of an entire life are told and it's important how characters react to the alternating currents of good luck or misfortune over a long arc of time. Most of the major themes of the Neapolitan novels are present in the three earlier books, although without the rich social context. The theme of women’s friendship is not in the earlier books but emerges as the narrative framework of the Neapolitan novels. The life-long friendship between Elena Greco and Lina (Lila) Cerullo is usually considered the main theme of the Neapolitan novels. To my knowledge, only one reviewer questioned its centrality. But is it more about envy/competition rather than about friendship? Or how the two can become inextricably linked? I no longer see friendship as the central theme of the Neapolitan novels but rather the framework for exploring the choices available to women whose options are constrained by gender/class. As in the earlier books, there is no one theme—but rather an elaborate tapestry of interrelated themes. Claire Messud has called Ferrante “Italy’s answer to Doris Lessing, Elena Greco is her Anna Wulf, and her tetralogy The Golden Notebook of our era.” Ferrante is a far more powerful writer than Lessing and (I think) a more powerful feminist. The complex interplay of feminist themes is present in all four books; in the final book the theme of motherhood—-the tension between wanting a life of one’s own and love for one’s children; the fear of failing to protect one’s children, the fear of losing them—-explored in The Lost Daughter, one of Ferrante’s earlier works——emerges as the dominant theme of the Story of the Lost Child. Ferrante explores the horrible consequences that can result from a moment’s inattention. For me, Ferrante’s books often trigger vivid memories of experiences only dimly recalled.Story of the Lost Child triggered memories of two such incidents. When my child was young, I was always afraid of losing him, of something horrible happening to him. In 1972, we were in Santiago de Chile in the Moneda Palace . I don’t recall exactly how it happened but I was holding my son and put him down on the ground and then looked away for a second and he was gone. He was just starting to walk on his own. I was in a state of total panic and then I looked across the room and there he was looking at me with amusement. I’ll never forget the fear and the overwhelming sensation of relief. The second time was during the same 1972 trip to South America, this time in a remote village on the Ecuadorian/ Columbian border. We had stopped in a little tavern and a woman grabbed my son and ran off with him. I was in a state of panic. His father who had the advantage of speaking Spanish said I shouldn’t worry as she was just showing him to the other people in the village who had never seen a baby who looked like him. They thought he looked like the Christ child. He was a very beautiful baby with blond curls, enormous brown eyes and a serene, almost Buddha-like smile. But I was not as sanguine as his father was that he would be returned and I spent a very uncomfortable half hour or so. He was returned in a very good mood; he looked like he had enjoyed the tour of the village, but in both cases what I remember was the sheer terror. SPOILER ALERT: Reading the Story of the Lost Child brought it all back. On a crowded Neapolitan street, Lila looks away for a few minutes and her daughter disappears without a trace, never to be found—-an unforgettable conclusion to an unforgettable series of novels.